Network Rail, the UK infrastructure manager, has confirmed that Ricardo Rail’s pantograph monitoring system – known as ‘PanMon’ – has been formally approved for use across the national network. 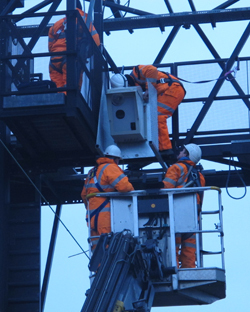 Ricardo Rail is now working with Network Rail for a wider roll-out of the system, commencing with four sites on the West Coast Main Line (WCML). This follows the successful completion of a two-year trial on the WCML, where the system proved capable of providing continuous and accurate measurements of pantograph uplift forces and defects (including chips, damaged end-horns and worn carbon strips) from trains passing at speeds of up to 125mph, meeting Network Rail’s pre-determined technical and performance criteria for the trial. The PanMon system is now designated for roll out as a replacement for the current 30 year old Panchex system, which is reaching the end of its serviceable life. Defective pantographs can inflict significant damage to overhead wires and associated apparatus. In extreme cases they can cause a de-wirement, requiring costly and time-consuming repairs and causing significant delays to services. While both pantographs – and the thin carbon strips they carry to draw current from the overhead contact wire – are subjected to thorough manual inspections during scheduled maintenance windows, defects can quickly accumulate. Remote monitoring technology such as PanMon enables infrastructure owners to identify those vehicles operating on the network that are at greater risk of inflicting damage to the wires, often due to general wear and tear. It can also help Network Rail work with operators to take early preventative action and, ultimately, extend the life of both the wires and the pantograph equipment carried by the trains. The PanMon system uses Sensys’ Automatic Pantograph Monitoring System (APMS) to provide high definition images of each passing pantograph through a combination of radar, laser, video and photo technology, and an innovative new contact-less optical uplift monitoring system developed by Ricardo Rail in association with Italian-based optical monitoring specialists DMA S.r.l, Turin. 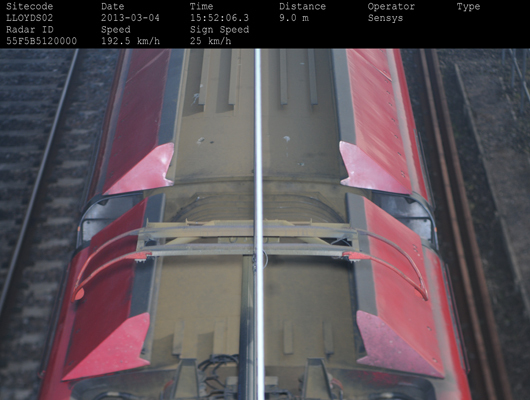 Using specialist “pattern-recognition” analysis software, the system automatically interprets the data to provide ongoing condition reports of each pantograph. This includes identifying the remaining thickness of carbon strips, and any damage to the pantograph’s head, aerofoils or the end horns, which can affect a vehicle’s ability to maintain good contact with overhead wires. The system can also measure the uplift of the contact wire resulting from the force applied by the pantograph – as uplifts exceeding specified limits can cause considerable damage to both pantograph and overhead wires. 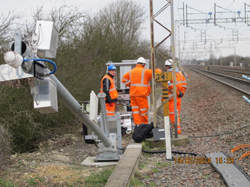 Network Rail’s Project Manager for the PanMon trial at Cheddington, Mike Dobbs, said “Getting new technology to work accurately and reliably in the rail environment can be challenging, but Ricardo Rail have worked closely with us during the trial to overcome the difficulties. I am delighted that we are now able to start the process of replacing our old Panchex systems with a 21st-century solution." David Bishop of Ricardo Rail said “We would like to thank the Network Rail Project team and the WCML train operators and maintainers, especially Alstom and Siemens, for their feedback and support during the trial. We are now looking forward to working with the industry to spread the benefits of enhanced monitoring of this critical component across the UK network." ‘PanMon’ forms part of the Ricardo Rail Intelligent Rail suite of asset monitoring and measurement services aimed at helping rail organisations use real-time performance data to deliver tangible operational improvements. Other available modules include ‘Infra-monitoring’ and ‘Smartfleet’, which provide real-time monitoring of track and rolling-stock condition respectively, as well as other services based on wheel impact, noise, vibration and ride comfort measurements.